As you look at your partner, do you ever think that their brain is vacuous? 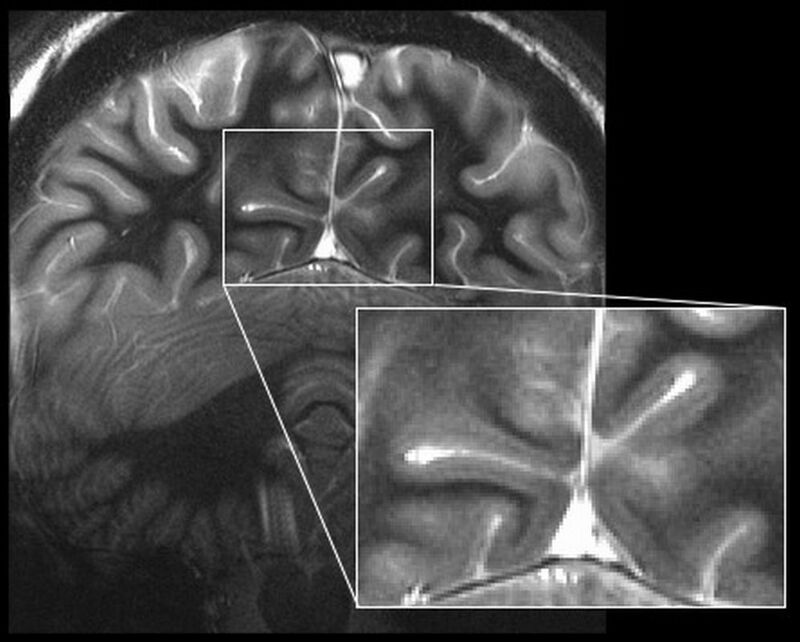 Well, as I was preparing for a KS3 science lecture about Cryogenic Engineering and its applications, that is exactly what I was left thinking as I dropped in an MRI scan of my partner’s brain into the presentation! Thankfully there is lots of space in Tim’s brain or it would suggest illness or disease! Image credit: Associate Professor Stuart Clare (https://www.ndcn.ox.ac.uk/team/stuart-clare) with permission of Tim Clare’s. To excite my students, I enjoy helping students undertake Science activities inside and out of the school. After racking my brains, I contacted Dr Ed Guise from Oxford Instruments (https://www.oxford-instruments.com/) , who is a friend and a super cool cryogenic engineer. 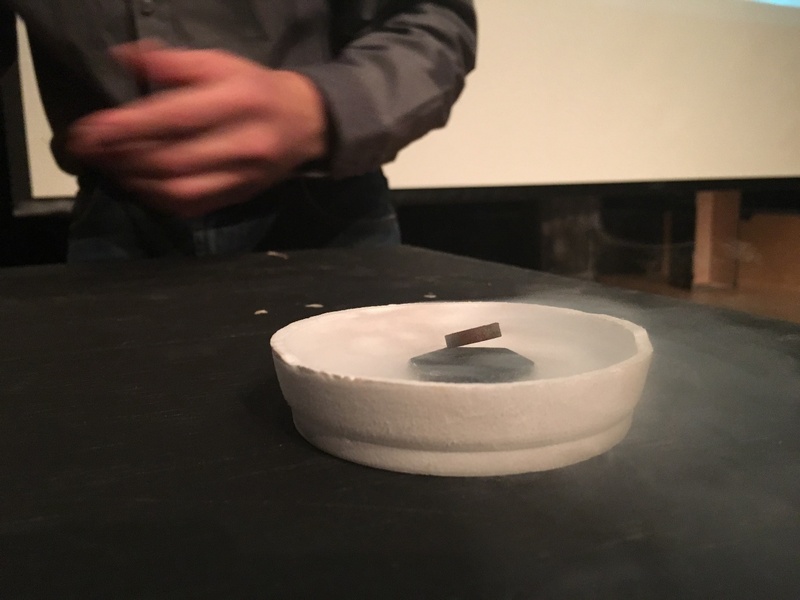 He used liquid nitrogen to super cool different items and show changes in their properties. This included the classic shattering of fruit and roses but also the liquification of air inside a balloon, the cooling of a piece of rubber pipe to ring a bell, demonstrations of a super conductor and using a super-cooled banana as a hammer! Superconductor in action, a little small to see but by using Lonely screen (http://eu.lonelyscreen.com/) this could be magnified onto the projector. Any school can arrange for a delivery of liquid nitrogen, and services such as Cryospeed (http://www.boconline.co.uk/en/how-to-buy/delivery-options/liquid-gas-delivery/liquid-gas-delivery.html) provide education dewars as well as cryogenic fluids for rental, these special vessels are venting and allow safe storage and reduce loss via evaporation. The cryogenic liquids can be stored for about two weeks in a dewar, and must be kept in the locked and well ventilated chemical store. It is acceptable to store with other gas cylinders and chemicals that are likely to be kept in schools. But, when returning to the chemical store for retrieval a second person should remain at the door to observe and aid if Asphyxiation occurs. When opening values to dispense liquid nitrogen eye protection as well as gauntlet-style, leather gloves should also be worn. Full safety details can be found at CLEAPSS section 11: http://www.cleapss.org.uk/. As the nitrogen boils off there is a risk of asphyxiation in oxygen-deficient atmosphere so ensure that he room is well ventilated and the demonstrations occur in the large volume of the theatres and halls. Interestingly, as liquid nitrogen boils, it may condense the oxygen in the air, and substances will burn more easily. Remove all sources of ignition, use in a well-ventilated area, have a fire blanket and fire extinguishers nearby. But, school should not be put off, as if the safety protocols are followed, the liquid nitrogen can excite as well as practically illustrating many concepts both in the traditional sciences but also in Food Science. Commercial companies like BOC offer training http://www.boctraining.co.uk/ as well as CLEAPSS offering help, advice and training http://www.cleapss.org.uk/. The closing parts of the lecture lead my students into thinking about current applications of cryogenics which includes MRI imaging. Oxford Sparks is a portal for engaging with a wealth of exciting science taking place across Oxford University, and has a wealth of differentiated resources for use in the classroom including some excellent lesson plans and resources on the use of MRI https://www.oxfordsparks.ox.ac.uk/content/spin-around-brain. As we dismissed the students to different classrooms for more activities, we moved to other areas of the school to train staff and demonstrate how it can be used. The Food Technology department was the first on our list, as their new AQA Food Science GCSE has quite a lot of science content in it. 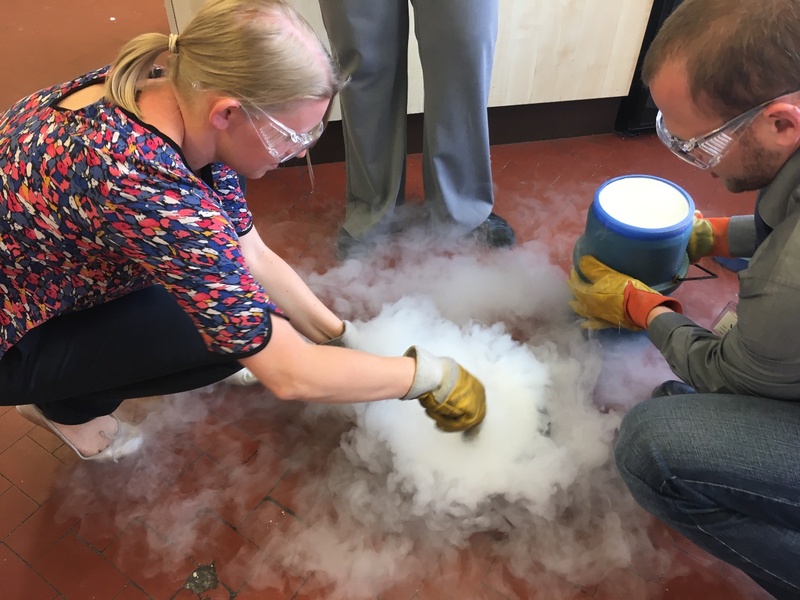 Staff had been asking about how to make ‘instant ice cream’, so we showed the teachers and some quite excited students how to make ice cream in moments using liquid nitrogen. They are now thinking about incorporating this into their open evening programme. Mrs Solomon and Dr Guise making a summer time treat in minutes! So why not think about the people that you know, and the families and friends of the children that you teach and see who you can persuade to come into school to ignite the imagination of your students! Sam Holyman is Second in Science at Aylesford School in Warwick, and West Midlands ASE President. She is also author of a number of best-selling science textbooks for KS3 and GCSE, and a keen advocate of innovative teaching and learning. She was recently nominated in the Teacher Scientist category for the Science Council’s 100 leading practicing scientists in 2015.